Striped jacket, by Rajesh Pratap Singh, New Delhi. She walks into the suburban studio 15 minutes before the appointed call time — and our Verve team, being used to stars arriving fashionably late, is pleasantly surprised to see her saunter in, dressed casually in jeans and a black tee. 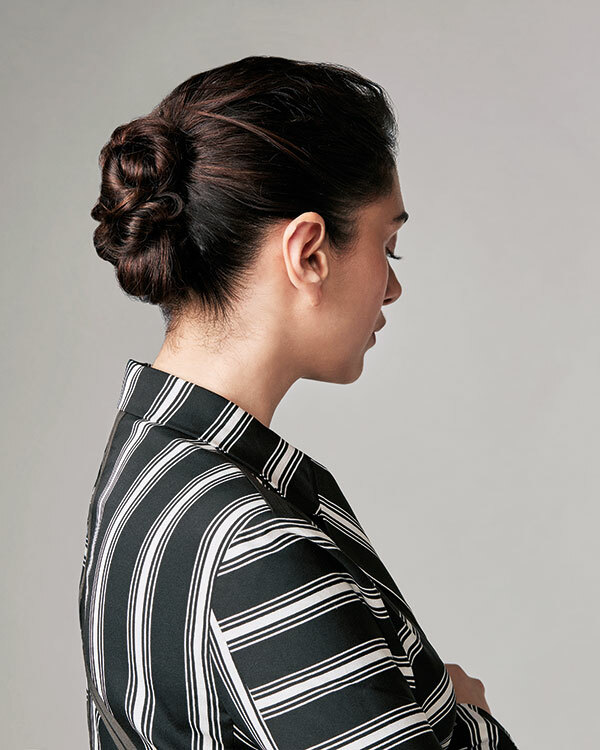 Greeting the photographer and stylist and after giving her outfits for the shoot a dekko, Aditi Rao Hydari heads to the make-up room to get ready to preen and pose for the Verve cover – a third time for her. The last few days have been hectic; she has constantly been travelling, she tells me, and is severely under-rested. “But the moment the camera comes on, I forget everything. The time between ‘action’ and ‘cut’ is a magical space,” she says. And you can see this the minute she steps into the frame — posing for the camera is like second nature to her. Blue satin dress, from Fendi, New Delhi. Belt with oversized rectangular covered buckle, from Michael Michael Kors; vintage gold ear studs, from Viange. Both in Mumbai. Cotton viscous red striped shirt, red striped pants in Moroccan crepe, calf leather belt, all by Dhruv Kapoor, New Delhi. Black suede pumps, Dior Tribales multicharm earrings, both from Dior, Mumbai. Black embroidered cotton silk top, trousers, both by Sanchita, Bengaluru. Bubble bangle, from Isharya; black suede pumps, from Dior. Both in Mumbai.